The Relay & Infrared Control System is ideal for any User who has a number of devices that need to be controlled. It has 8 external (4 x relay, 4 x IR) and 8 internal (WebGUI/TelNET) trigger connections which activate 16 User defined macro events stored within the unit. Comprehensive User control interfaces are available including WebGUI, Telnet and console (RS-232 in). 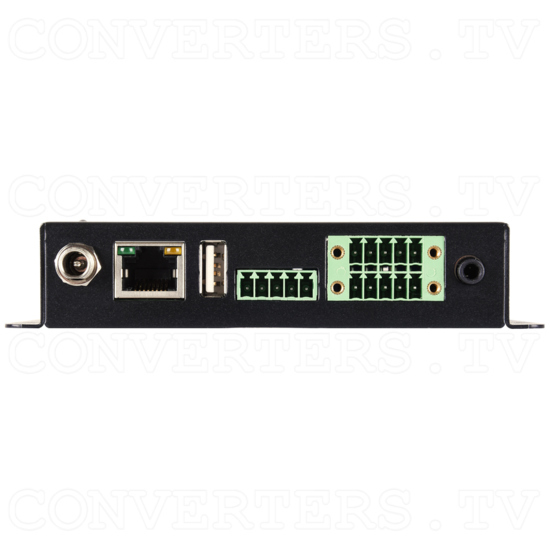 All 16 macros are available to be activated by these interfaces and send commands to remote devices via an Ethernet link, IR (×4), relay trigger (×4) or RS-232/422/485 (×1), allowing for the control of a large array of devices, all at the push of a button. Integrated IR code learning is also available, allowing the User to store and re-transmit the IR codes sent by most standard IR remotes. A robust scheduling function, with adjustable daylight saving time support, provides the unit with the ability to activate any programmed macro at any set time, or even according to a weekly schedule. Last but not least, the Relay & Infrared Control System supports Power over Ethernet (PoE), allowing it to be powered directly from a standard PoE network switch. Without the need for an external power adapter, this gives incredible flexibility for remote site installations. The Relay & Infrared Control System is ideal for any User who has a number of devices that need to be controlled. It has 8 external (4 x relay, 4 x IR) and 8 internal (WebGUI/TelNET) trigger connections which activate 16 User defined macro events stored within the unit. Comprehensive User control interfaces are available including WebGUI, Telnet and console (RS-232 in). All 16 macros are available to be activated by these interfaces and send commands to remote devices via an Ethernet link, IR (×4), relay trigger (×4) or RS-232/422/485 (×1), allowing for the control of a large array of devices, all at the push of a button. Integrated IR code learning is also available, allowing the User to store and re-transmit the IR codes sent by most standard IR remotes. A robust scheduling function, with adjustable daylight saving time support, provides the unit with the ability to activate any programmed macro at any set time, or even according to a weekly schedule. Last but not least, the Relay & Infrared Control System supports Power over Ethernet (PoE), allowing it to be powered directly from a standard PoE network switch. Without the need for an external power adapter, this gives incredible flexibility for remote site installations. 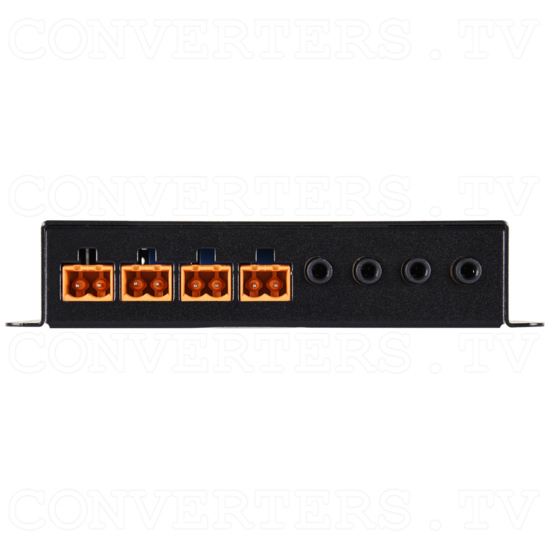 4 x relay trigger outputs to control devices such as projector screens, lighting, etc. 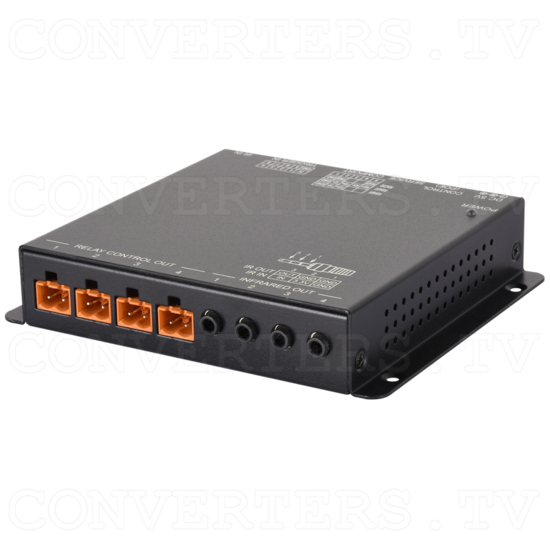 4 x IR Out to control devices such as TVs, media players, etc.